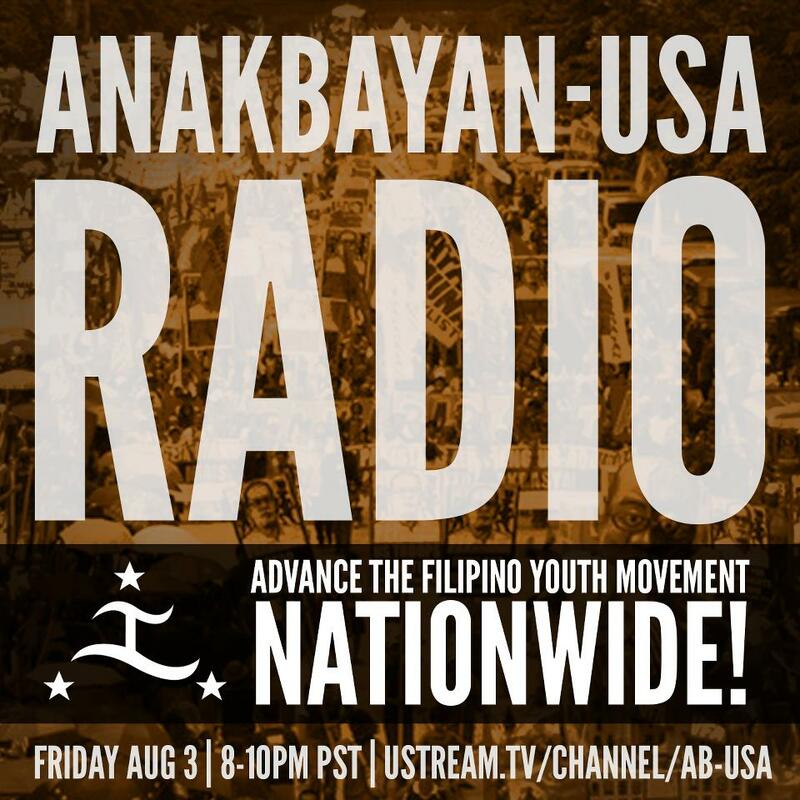 USA – Anakbayan-USA condemns the violent demolition at Le Jardin and the illegal arrest and detention of the “Le Jardin 4”. The youth group demands that the Philippine National Police (PNP) of Talomo District and the City Prosecutor’s Office of Davao immediately drop the charges against the Le Jardin 4. “The Le Jardin 4 were acting on their inalienable rights to defend their communities against the provocations of the members of PNP who used excessive force against the protesters. Also, this is clearly a land grabbing effort by the Carlos Villa Abrille & Sons Incorporated and Filinvest Lands against the residents of the Bariquit compound. It is only right that the youth and the residents resist against these injustices” said Yves Nibungco, National Chairperson of Anakbayan-USA. “Therefore, we demand that charges against the Le Jardin 4 be immediately and unconditionally dropped,” Nibungco added. The “Le Jardin 4” is coined to refer to the four youth and student activists who were arrested at the Le Jardin, Bariquit Compound, Davao City. Last August 25, 20 members of the PNP Talomo District under the direction of Superintendent Dionisio C. Abude came to Bariquit compound fully armed, in order to implement the Villa Abrille’s fence permit. Residents and members of progressive groups resisted the attempted destruction of the passage used to enter and exit the compound. During the commotion, the police used excessive force at the youth and residents. The “Le Jardin 4” are Joselito Lagon, Jr. 23, regional spokesperson of Kabataang Artista para sa Tunay na Kalayaan (KARATULA); Wyrlo Enero, 19, member of the League of Filipino Students (LFS); Johnny Boy Urbina, 24, and John Michael Lim, both members of Anakbayan-Davao. They were beaten and electrocuted before being loaded in the police mobile. The Le Jardin 4 has been released after posting bail and after mounting pressure from a series of international protests launched by supporters online and in the community. Le Jardin, also known as Bariquit compound, has been a disputed area since 1973. The powerful Villa Abrilles family, who is trying to grab the land, sued Marcela Camomot for allegedly living in the lot illegally. However, Camomot was able to prove in court that her family had been tilling the land since 1962. Currently, the residents are fighting against the joint landgrabbing efforts by Carlos Villa Abrilles & Sons Inc. and prominent realty firm Filinvest Lands. The Ville Abrille’s have been more aggressive in evicting families from Le Jardin in order to continue a join venture with Filinvest Lands to build a high-end residential subdivision. Reports of shootings by the security hired by the Ville Abrilles occur almost every day. It is employed as an intimidation tactic to force the remaining 13 families from Le Jardin. Many of their crops and fruit trees have also been destroyed, causing youth activists to work with the community in a gardening project to make up for lost crops. Last month, the community’s electricity and water were officially cut off, making living conditions more difficult. Earlier this year, there were 60 families living in Le Jardin, but soon vacated after being paid off by the Villa Abrilles. Recently, members of Anakbayan-USA’s Los Angeles and San Diego chapters joined a medical mission in Mindanao. They had the opportunity to visit Bariquit compound and talk to its residents in order to understand their struggle against the common practice of gentrification or “land grabbing” by the landed elite in the Philippines. “I have integrated with urban and rural communities (Davao City, Diwalwal, Pantukan and Talaingod) in Mindanao for the last two months and all have expressed that the major reasons why they are being displaced is because of foreign and national investments destroying local businesses and a lack of genuine land reform where families are able to find a sense of livelihood. Members of the Philippine military and police have committed human rights violations against its people to enforce these interests,” said Eugene Gambol, member of Anakbayan San Diego. These, according the young activists, are the same reasons why thousands of Filipino leave the country in search for greener pastures. “As a Filipino-American, whose parents migrated due to dire economic conditions, I clearly identify with the plight of the residents of Le Jardin,” said Rose Dominguez, also participant to the medical mission and a member of Anakbayan Los Angeles. “Though we’re thousands of miles away, we must realize that we are integral to the struggle of our people for social justice and dignity. ” said Dominguez. Eugene, Rose and other young Filipino-Americans like them said they will continue their activism highlighting the case of the Le Jardin 4 and the residents of Bariquit Compound when they come back in the United States. They urge the Filipino American community to support the Le Jardin 4 in their struggle against displacement and land grabbing. sappearances. Imprisonment under secret or uncertain circumstances is a grave violation of some conceptions of human rights as well as, in the case of an armed conflict, of International Humanitarian Law.Under the current President of the Philippines, Benigno “Noynoy” Aquino III, there have been 11 cases of Enforced Disappearances in the Philippines.Since the Arroyo Regime (2001-2010), 205 are still missing. The families seek justice, the Philippine government must be pressured to SURFACE THE DISAPPEARED and END IMPUNITY NOW!We demand that these victims are surfaced and their perpetrators are brought to justice. This event is endorsed by BAYAN USA, Anakbayan-NJ, Anakbayan-NY, Filipinas for Rights and Empowerment, Action 21 and ILPS US NE. in completing said application at no cost. Sadly, a few attorneys and notary publics are taking advantage of the great need for relief among this population and charging exuberant rates. Please answer this call for volunteers and forward it to fellow organization members. Supervising attorneys from the Center for Social Justice of Seton Hall Law, law students from the Women’s Law Forum of Seton Hall Law, as well as students from the LGBTQ Resource and Diversity Center at Rutgers, have committed to co-sponsor this event with NJ DAC. 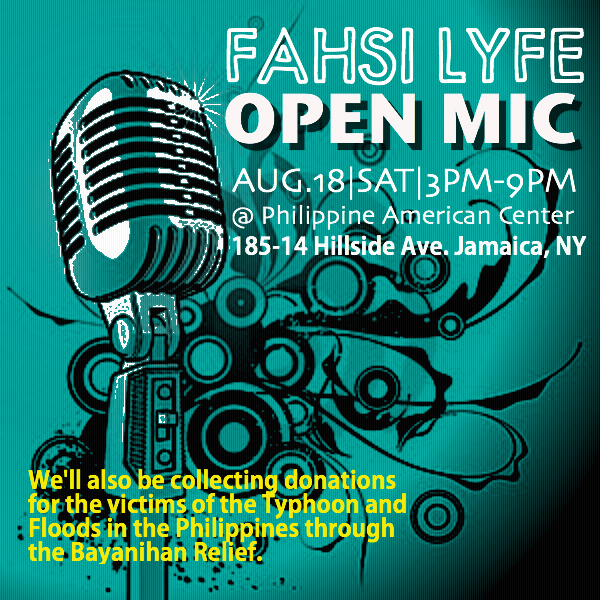 The event will be held on Saturday August 25, 2012 in rooms 255-7 of the Paul Robeson Cultural Center of Rutgers-Newark, 350 Dr. Martin Luther King, Jr. Blvd, Newark, NJ. Volunteers will receive training from 8:00am – 10:00am to assist applicants with the Deferred Action application from 11:00am to 5:00pm. Volunteers may provide assistance in shifts or for the full day. 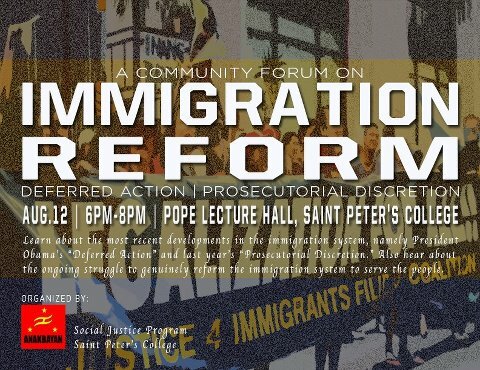 Jersey City, NJ -Filipino youth activist group, Anakbayan New Jersey, joined forces with immigrant and lawyers organizations last August 12 for a “Community Forum on Immigration Reform: Deferred Action” held at the Pope Lecture Hall, Saint Peter’s College in Jersey City. The said forum provided vital information regarding the Deferred Action of Childhood Arrivals (DACA) or most commonly known as “Deferred Action.” It also aimed to empower the Jersey City immigrant community to continue the struggle for comprehensive immigration reform. The immigrant community turned out in large numbers to learn about the said new immigration policy. Anna Brown, head of the Social Justice Program of Saint Peter’s College, gave a warm welcome to the attendees of the forum. Councilman at-large, Rolando Lavarro, also gave welcoming remarks, commenting on his own experience. The speakers include DREAM Act activists, Giancarlo Tello and Brenda Aguilar of the New Jersey DREAM Act Coalition (NJDAC), and Filipino lawyer and immigrant rights advocate, Attorney Cristina Godinez. They provided an overview regarding the said new policy. The forum also provided free legal consultations to the community headed by lawyers from the Asian American Legal Defense and Education Fund (AALDEF). “Deferred Action is simply a stop-gap measure, a band-aid for the overall immigration issue that America faces and is not to be confused with the Dream Act. While the Dream Act is definitely a goal, we should not and will not forget our parents, aunts, and uncles and will continue to push towards ultimately Comprehensive Immigration Reform,” said Giancarlo, core member of the New Jersey DREAM Act Coalition or NJDAC. . Meanwhile leaders in the Filipino community talked about the need to build a strong immigrant movement. Jonna Baldres, Deputy Secretary General of the National Alliance for Filipino Concerns (NAFCON) gave a comprehensive presentation on the socio-economic factors that lead to forced migration. “We only want to provide for our families but our governments are forcing us to migrate to look for livelihood elsewhere, separating us from our loved ones. We must come together, stand up and fight against the 1% that exploits us. It is only just for us to demand respect, dignity, wages, benefits and rights that are rightfully ours and due to us, until we achieve full legalization for all,” said Ms. Baldres. According to statistics, an estimated 2 million individuals nationwide and 40,000 in New Jersey can be eligible for deferred action. “It is important to note, however, that Deferred Action is not so much an achievement of the Obama administration, as it is the product of thousands of Dream Activists and allied organized forces, who continue to put pressure on US lawmakers in order to assert their rights as undocumented youth,” Bea Sabino, Chairperson of AnakBayan New Jersy, added. Community leaders urge the immigrant community to stay informed, be vigilant and organize support for comprehensive immigration reform. Anakbayan New Jersey called on the Filipino youth to take part in fighting for immigrant rights. “Filipinos are the second largest immigrant community in the United States. We come from five centuries worth of migration history, which includes notable personalities like Philip Vera Cruz and Carlos Bulosan, who dedicated their lives to fighting for the civil rights of immigrant workers. Our identity as young Filipinos in America is deeply rooted in that history; hence, we must step up in continuing the struggle against racism, exploitation, illegalization and criminalization of immigrants. At this juncture in US immigration policy, we must always keep in mind that, undocumented or not, every human being has rights to education, fair and just wages, healthcare and the due process of law,” concluded Ms. Sabino. The Community Forum on Immigration Reform: Deferred Action was organized by Anakbayan New Jersey and was endorsed and co-sponsored by the National Alliance for Filipino Concerns (NAFCON), Philippine Forum-New Jersey, Filipinas for Rights and Empowerment (FiRE), New Jersey DREAM Act Coalition (NJDAC), Asian-American Legal Defense and Education Fund (AALDEF), Action 21, and the Saint Peter’s College Social Justice Program. 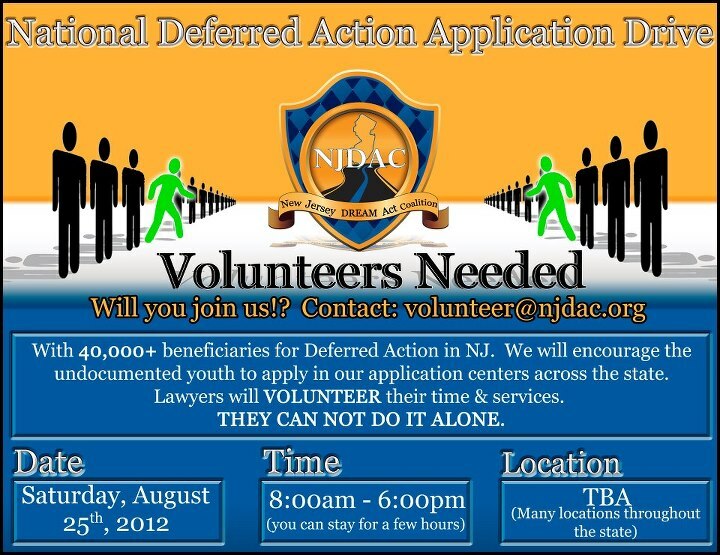 What is Deferred Action? What is Prosecutorial Discretion? Legalization for All? Learn about the most recent development in the U.S. Immigration policy, particularly President Obama’s Deferred Action and Prosecutorial Discretion. Also learn about the ongoing movement to genuinely reform the immigration system into one that truly serves the people. What: Community Forum on Immigration Reform: Deferred Action and Prosecutorial Discretion. Why: Currently, 4,700 Filipinos leave the Philippines every day to look for jobs abroad. The U.S. remains to be the primary destination of migrant Filipinos. There is an estimated 5 million Filipinos in the US, where 1 million are undocumented. An alarming number of labor trafficking cases have emerged within the past year, and undocumented youth have yet to come out of the shadows. This phenomenon is testament to the urgency of addressing the issue of immigration reform in our communities. It is essential that we learn about the recent developments in the nation’s immigration policies, particularly the most recent “Deferred Action” and last year’s “Prosecutorial Discretion” in order to empower ourselves and to uphold our rights as im/migrants in the United States. FREE LEGAL CLINIC WILL BE FACILITATED BY ASIAN AMERICAN LEGAL DEFENSE AND EDUCATION FUND (AALDEF) THROUGHOUT THE PROGRAM. For more information, please email us at anakbayan.nynj@gmail.com or call Bea at 201 779 6886.